A comet is an small icy body that when passing close to the sun heats up and begins to outgas displaying a surrounding "coma" (visible atmosphere) and at times a tail. These phenomena are due to the effects of solar radiation and the solar wind upon the nucleus of the comet. Comets have been observed since ancient times by many cultures. The streams of dust and gas that are released from the comet nucleus form a huge coma around a comet. The force exerted on the coma by the sun's radiation pressure and solar wind cause an enormous tail to form continuously pointing away from the sun. Comet nuclei range from a few hundred meters to many kilometers across and are composed of loose collections of ice, dust, and small rocky particles. However, the surface of the nucleus is generally dry and dusty or rocky, which suggests that the water ices are hidden beneath the surface crust several meters thick. Comet ISON was discovered on September 21, 2012 by two Russian astronomers. See the ISON photo to the left taken by the Hubble Space Telescope. It completely disintegrated as it passed very close to the sun in early December, 2013. Short-period comets are elliptical (see the illustration to the left) and originate in the Kuiper (ky'-per) belt which lies just beyond the orbit of Neptune (see the illustration to the left below). Short-period comets have orbital periods less than 200 years and are more-or-less in the same plane as our sun and the eight planets. 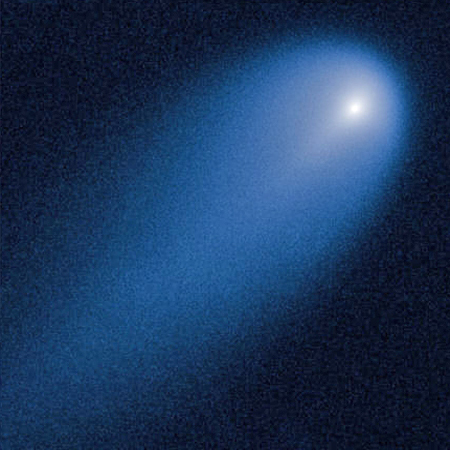 Long-period comets are also elliptical, but originate in the Oort Cloud, a spherical cloud of icy bodies extending from outside the Kuiper belt to halfway to the nearest star. Long-period comets have orbits greater than 200 years. They are believed to be set in motion towards the sun by gravitational perturbations caused by passing stars. Parabolic comets pass once through the inner Solar System. If a comet is traveling at "exactly escape velocity", it is on a parabolic trajectory. A parabolic comet is in a temporary state of being either captured by the sun, or being totally ejected out of the Solar System, or oscillating back and forth from one state to the other. Comets from the Kuiper Belt or the further out Oort Cloud move in humongous orbits around the sun. Comets have a wide range of orbital periods ranging from several years to several million years. Many of these outer comets are "centaurs". Centaurs (large comets) have a diameter of at least 1 kilometer (.62 miles) or more. As of July 2017, there were 406 centaurs listed in the NASA Jet Propulsion Small-Body Database. It is estimated that there are about 44,000 centaurs in the Solar System. Because centaurs are not constrained by "orbital resonance" (gravity from other large orbiting bodies) their orbits around the sun are somewhat unstable with huge rotational time scales - up to one million years. Because they are so distant, centaurs appear as pinpricks of light and many of them can not be seen by even our largest telescopes. Centaurs are typically 50 kilometers (31 miles) or more in size. A single centaur body contains more mass than the population of all earth-crossing "asteroids" discovered to date. A decade ago, Stephen Hawking warned that one of the major factors in the possible scarcity of intelligent life in our galaxy is the high probability of a comet colliding with inhabited planets. In December of 2016 a team of astronomers from Armagh (Ar'-ma) Observatory in Northern Ireland and the University of Buckingham in the UK reported that the recent discovery of hundreds of giant comets in the outer planetary system means that these objects pose a much greater hazard to life on earth than do asteroids. Many centaurs cross the paths of the massive outer planets - Jupiter, Saturn, Uranus and Neptune. The gravitational fields from these outer planets can occasionally deflect these centaurs in towards the earth. See the NASA illustration above. 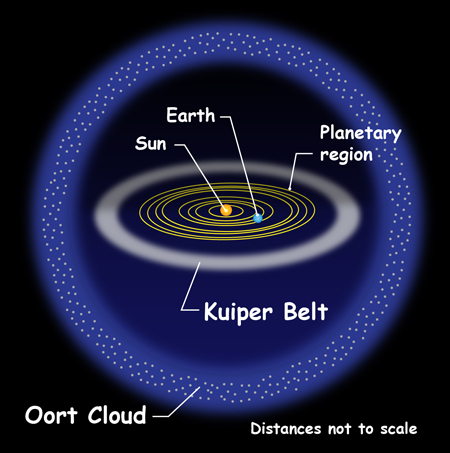 James Bauer, a research professor at the University of Maryland at College Park, says "We now know that there are more relatively large chunks of ancient material coming from the Oort Cloud than we thought." Comets that take more than 200 years to make one revolution around the sun are notoriously difficult to study. As a result we do not have a good handle on the dangers they represent. 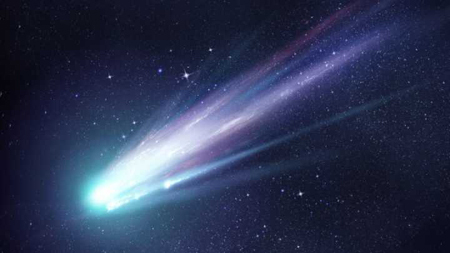 Scientists found that there are about seven times more long-period comets than had been predicted previously. They also found that long-period comets are on average up to twice as large as "Jupiter family comets," whose orbits are shaped by Jupiter's gravity and have periods of less than 20 years. Researchers also observed that in eight months, three to five times as many long-period comets passed by the sun than had been predicted. The existence of so many more long-period comets than predicted suggests that more of them have likely impacted planets in the past, delivering icy materials from the outer reaches of the solar system. Researchers also found "clustering" in the orbits of the long-period comets they studied. This suggests that initially there might have been larger bodies that subsequently broke apart to form the clusters. In November 2011, Australian amateur astronomer Terry Lovejoy discovered a faint object, Comet C/2011 W3, now know as Comet Lovejoy. 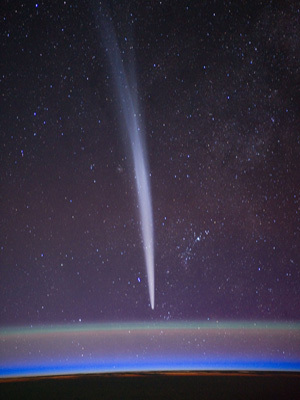 Comet Lovejoy was a Kreutz (kroits) sungrazer, a comet whose orbit takes it extremely close to the sun at its perihelion (per-y-ˈhēl-yan), the point in its orbit closest to the sun. See the Lovejoy photo from the International Space Station to the left. Note the atmosphere of the earth. Lovejoy had passed by the sun and was returning to outer space when this photo was taken. Another good photo of Lovejoy is in the banner at the very top of this web page. Kreutz sungrazers are typically small comets, about 10 meters wide, and numerous (several traveling together that probably are fragments broken apart from the same original comet). The Solar and Heliospheric Observatory (SOHO) sees a Kreutz comet passing by the sun every few days. However, Comet Lovejoy was was estimated to be at least 500 meters in diameter and was clocked at a speed of 330 miles per second (535 km/s). On December 16th, 2011, Comet Lovejoy was a surprise to most astronomers when it survived its fiery plunge just 87,000 miles from the sun’s surface (about a third the distance between the earth and our moon). Because it was visible from earth during the Christmas Holidays it was also nicknamed "The Great Christmas Comet of 2011". "It's absolutely astounding," said Karl Battams of the Naval Research Lab in Washington DC. "I did not think the comet's icy core was big enough to survive plunging close to the several million degree solar corona for about an hour, but Comet Lovejoy is still with us. This is all new," says Battams. "SDO (NASA's Solar Dynamics Observatory) is giving us our first look at comets travelling through the sun's atmosphere. How the two interact is cutting-edge research." Comet Hale-Bopp, formally C/1995 O1, was one of the brightest and perhaps the most widely observed comet of the 20th century. The comet was discovered independently on July 23, 1995 by two observers, Alan Hale and Thomas Bopp. See the photo of Hale-Bopp to the left. 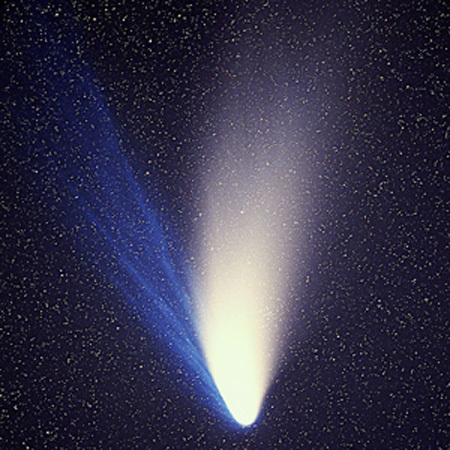 Hale had spent many hundreds of hours searching for comets and was tracking known comets from his driveway in New Mexico when he chanced upon Hale-Bopp just after midnight. Bopp did not own a telescope. He was out with friends near Stanfield, Arizona observing galaxies when he came across the comet while at his friend's telescope. Both had discovered Hale-Bopp on the same day and then filed with the the Central Bureau for Astronomical Telegrams, the clearing house for astronomical discoveries. Hale-Bopp's original position was calculated as 7.2 AU (astronomical units) from the sun, placing it between Jupiter and Saturn and by far the greatest distance at which a comet had ever been discovered by amateurs. Most comets at this distance are extremely faint and show no discernible external activity, but Hale-Bopp already had an observable coma. Hale-Bopp became visible to the naked eye the following year in May 1996. It was too closely aligned with the sun to be observable during December 1996, but when it reappeared in January 1997 it was bright enough to be seen by anyone who looked for it, even from large cities with light-polluted skies. The comet likely made its previous perihelion 4,200 years ago in 2215 BC. "2215 BC" WOW! The probability of Hale-Bopp striking the earth in a future passage is very, very remote. However, given that the comet's nucleus is about 60 kilometers (37 miles) in diameter, the consequences of such an impact would be apocalyptic - about 44 times the energy of the Cretaceous impact event that killed all the dinosaurs. One of the most remarkable discoveries was that the comet had a third type of tail in addition to the well-known gas and dust tails. Hale-Bopp exhibited a faint sodium tail, only visible with powerful instruments with dedicated filters. Sodium emissions had been previously observed in other comets, but had not been observed from a comet tail. Hale-Bopp's sodium tail consisted of neutral atoms (not ions), and extended some 50 million kilometers (31 million miles) in length. Halley's Comet is a short-period comet visible from earth every 74 to 79 years. Halley is the only known short-period comet that is regularly visible to the naked eye from earth. It is the only naked-eye comet that might appear twice in a human lifetime. Halley last appeared in the inner parts of the Solar System in 1986 and will next appear in mid-2061. See the Halley photo to the left taken in 1986. Halley's returns to the inner Solar System have been observed and recorded by astronomers since at least 240 BC. Clear records of the comet's appearances were made by Chinese, Babylonian, and medieval European chroniclers. However, they were not recognized as reappearances of the same object at the time. The comet's periodicity was first determined in 1705 by English astronomer Edmond Halley, after whom it was named. During its 1986 appearance, Halley's Comet became the first comet to be observed in detail by spacecraft, providing the first observational data on the structure of a comet nucleus and the mechanisms of coma and tail formations. These observations supported a number of long-standing hypotheses about comet construction, particularly Fred Whipple's "dirty snowball" model, which correctly predicted that Halley would be composed of a mixture of volatile ices – such as dust, water, carbon dioxide, and ammonia. It is now confirmed that the surface of Halley is largely composed of dusty, non-volatile materials, and that only a small portion of the nucleus is ice. Halley's orbital period has varied between 74 to 79 years since 240 BC. 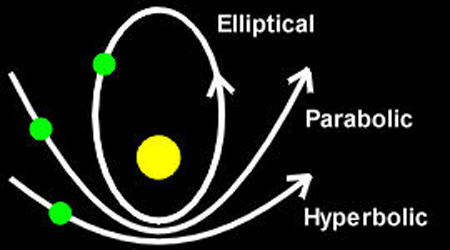 Its orbit around the sun is highly elliptical, with an orbital eccentricity of 0.967 (with 0 being a circle and 1 being a parabolic trajectory). The perihelion, closest point to the sun, is about 0.6 AU. This puts it close to the orbit of Venus. Its aphelion, or farthest distance from the sun, is 35 AU (roughly the distance of Pluto). Unusual for an object in the Solar System, Halley's orbit is retrograde; it orbits the Sun in the opposite direction to the planets. The orbit is inclined by 18° to the ecliptic orbit (the sun's orbital path) with much of it lying south of the ecliptic. Due to the reverse orbit, it has one of the highest velocities relative to the earth of any object in the Solar System. The 1910 passage was at a relative velocity of 70.6 km/s (157,850 mph). Because its orbit comes close to earth's in two places, Halley is associated with two meteor showers: the Eta Aquariids in early May, and the Orionids in late October. Halley is the parent body to the Orionids. 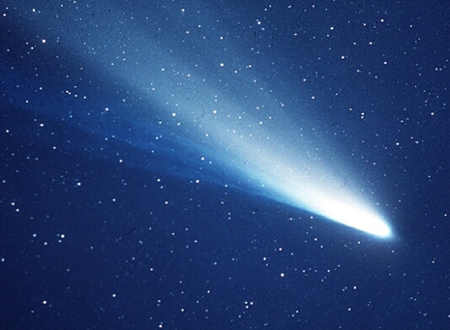 Observations conducted around the time of Halley's appearance in 1986 suggest that the comet could also be the parent of the Eta Aquariid meteor shower. It appears that the Eta Aquariid meteors separated from Halley’s Comet hundreds of years ago.